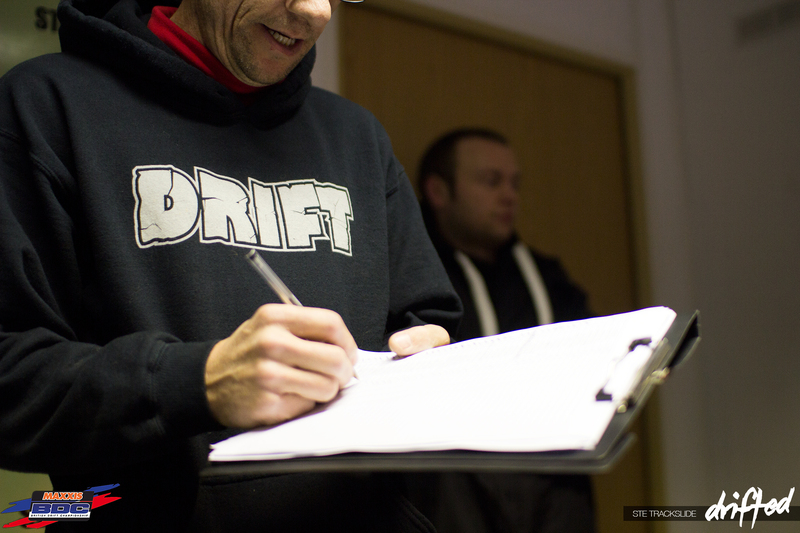 For many, a British Drift Championship license day marks the beginning of the UK drift season. 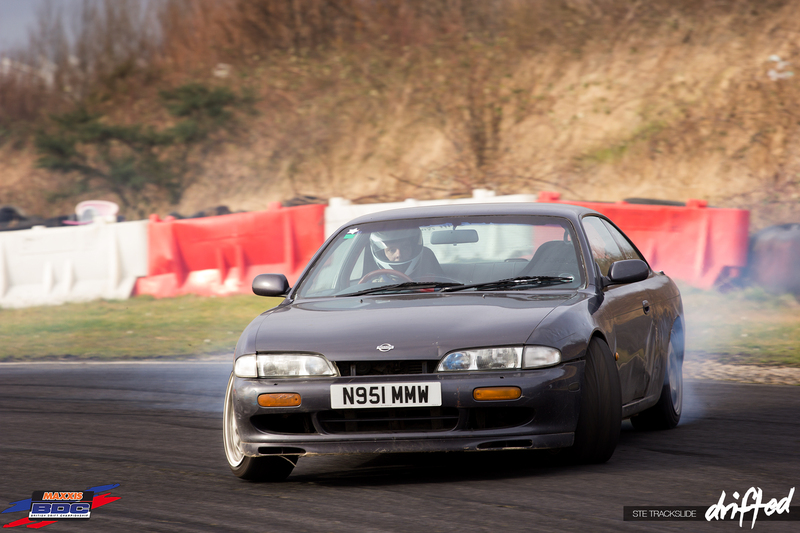 We try to occupy ourselves with rebuilds and features over the winter months which are great, but nothing quite beats being at a track hearing the screeching tyres, roaring engines and the smell of that awesome unmistakable byproduct of drifting, tyre smoke. The North East has received a beating by the wind over the last couple of weeks and this weekend was no different, with winds so strong they were actually pushing the cars into a spin once they broke traction; I could barely stay on my feet, let alone hold my camera steady. 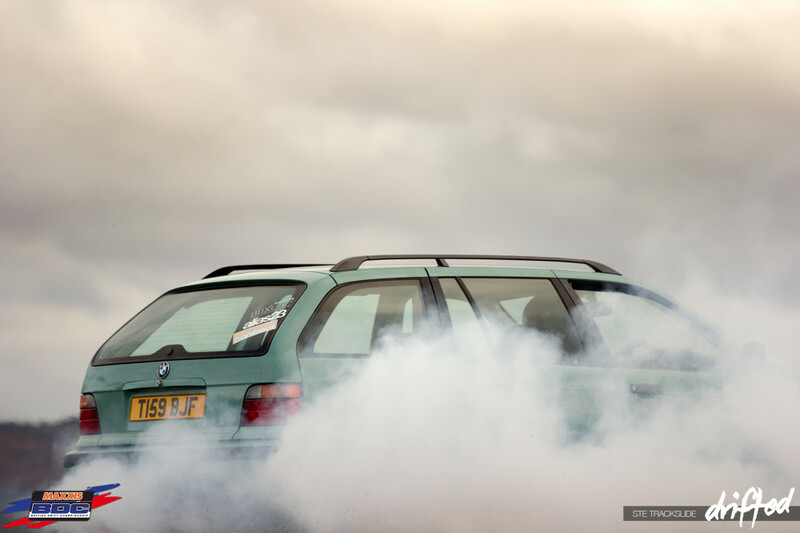 Just another day at Teesside Autodrome. 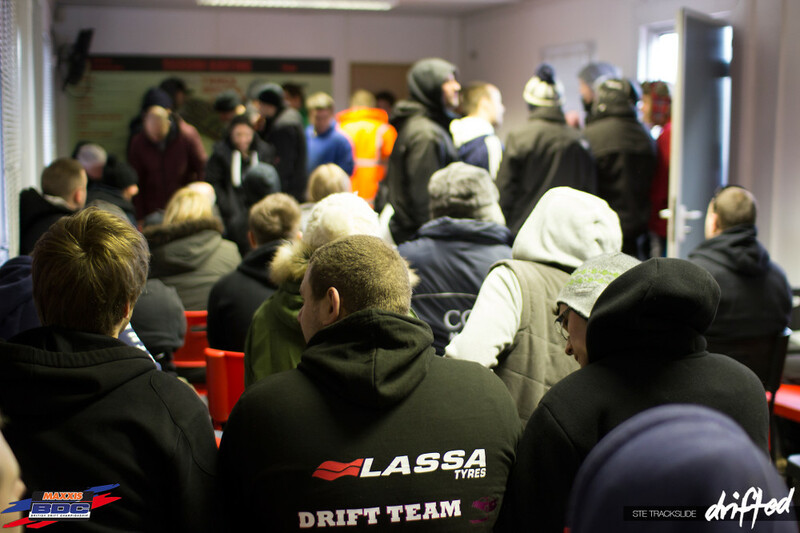 After signing in, everyone piled into race control for the morning drivers briefing. 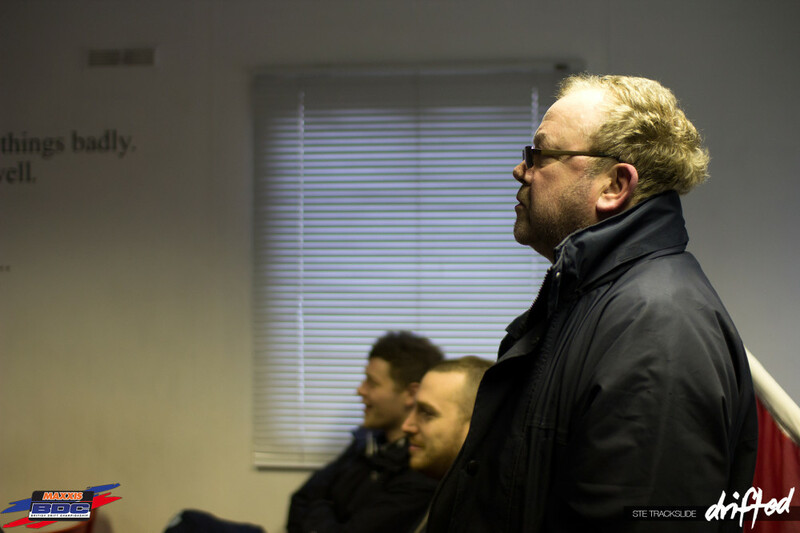 There were plenty of familiar faces as well as some new ones, with 40 plus people in a room the size of a portacabin, it got pretty warm, even though outside was freezing. Mark ‘Sweeps’ Buckle did his thing giving the new comers all the advice and information they needed to produce runs that would qualify as a pass for their license, including track layout, what lines to take and which clipping points to hit. 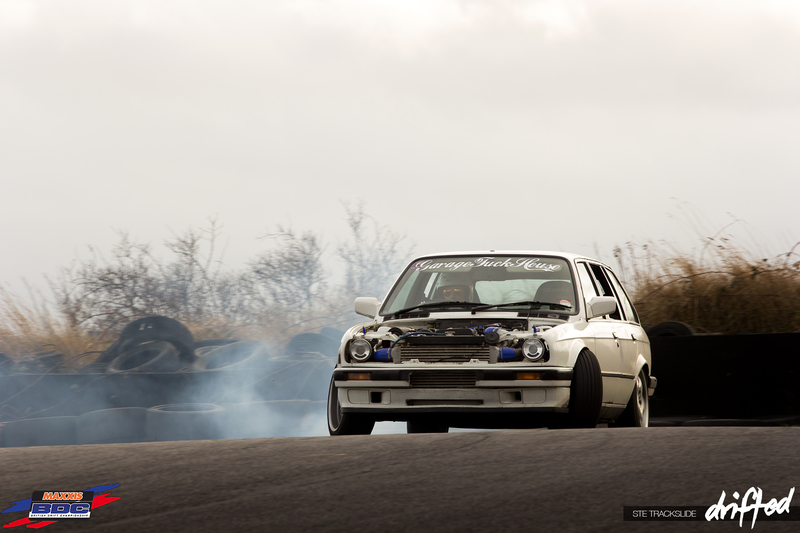 Alongside Sweeps was BDC and Drift-Allstars driver Walton Smith and BDC driver Marc Huxley attending as judges for the day. After the briefing we headed for the track; on the way I spotted this. I think most drifters and drift fans alike can appreciate a big body drift car like this Cresta. 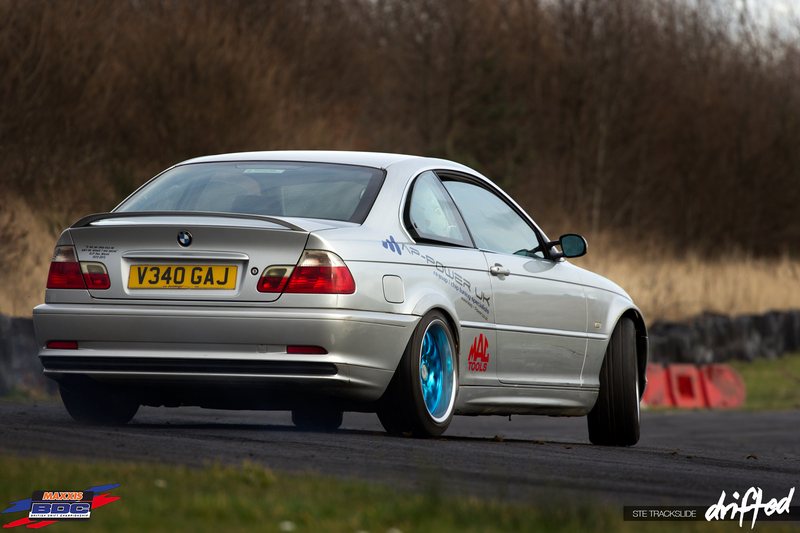 There’s just something about seeing a huge car in a track orientated environment. 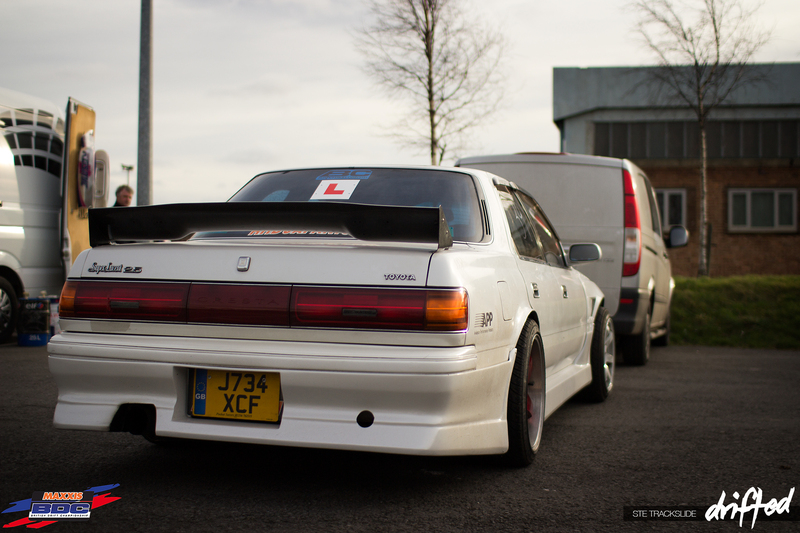 I’m more of a JZX100 mk1 fan personally but this is just as cool. The first hour or so was quite entertaining due to the wind I mentioned earlier; I know it sounds like a bit of an exaggeration but it really was having an effect on the cars. At first I thought it may have been a lack of talent but when every single car started overshooting the first corner and then struggled to make the next one, which is into the wind and up a gradient, it was pretty obvious what was happening. Imagine 80mph gusts hitting your car on the motorway; scary right? Now imagine that whilst drifting, when your tyres are no longer keeping you anchored to the ground! No wonder the drivers were having a hard time. 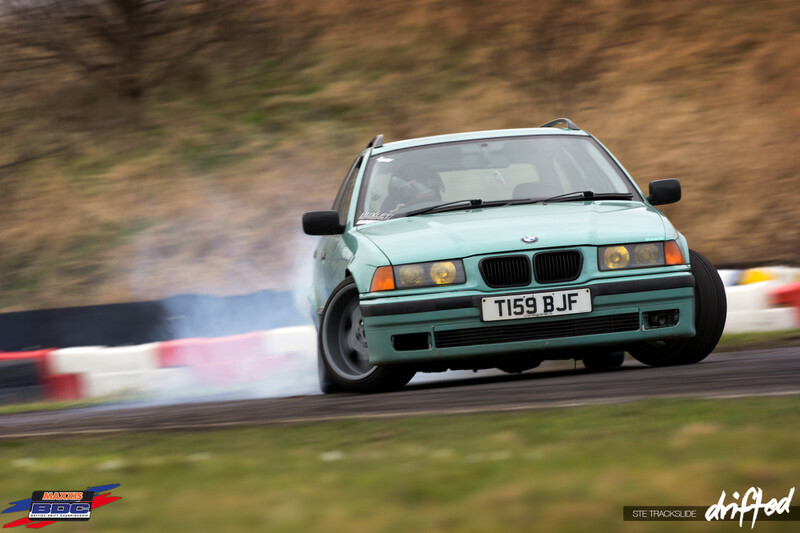 Peter Hayden was here in his little e36 compact; we mentioned Peter’s car on our Facebook page a couple of weeks ago saying it had that awesome M3-EVO motor. 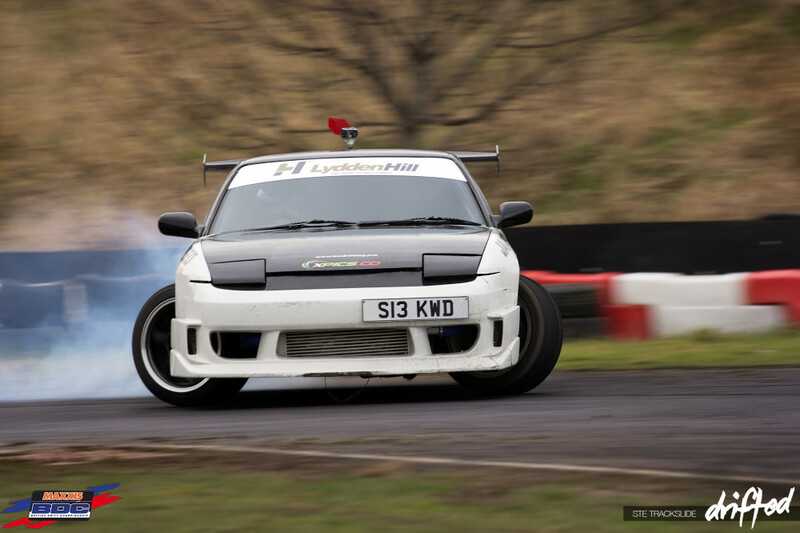 At only 17 years old he was drifting before he had even passed his driving test. 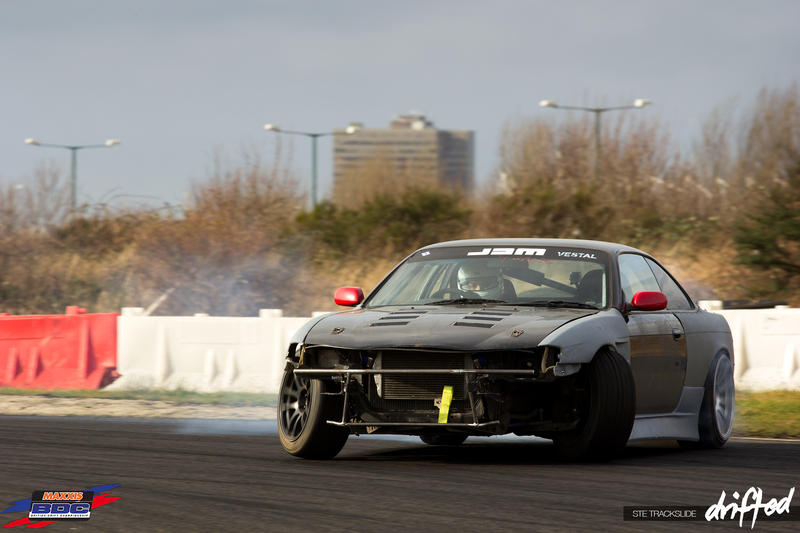 I for one can say he definitely has the skill and commitment of a competition drifter, but unfortunately it just wasn’t his day on Sunday as he failed to obtain his BDC license. I’m sure he will keep trying and will get there someday soon. As the morning progressed the wind became even worse with no sign of letting up. 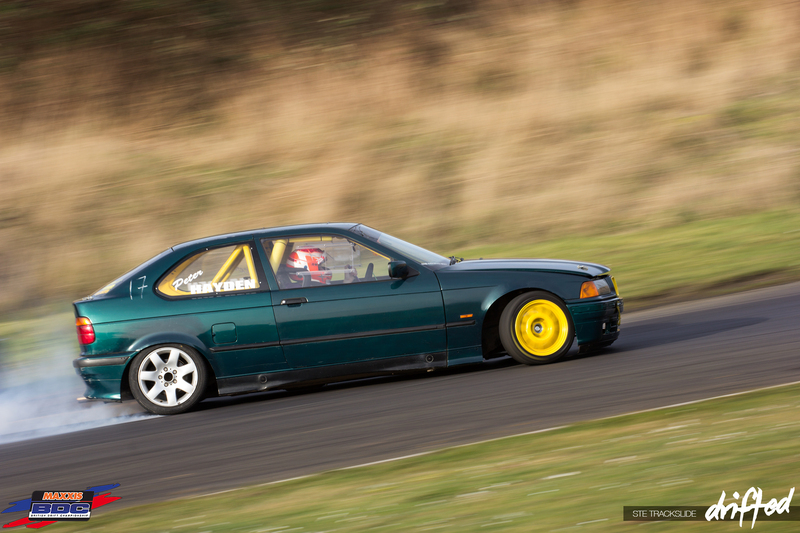 William Rose, one of the hard chargers of the day, is seen here in another e36 Compact getting very backwards. He didn’t hold it, but 10 out of 10 for effort, he also earned his Pro license. 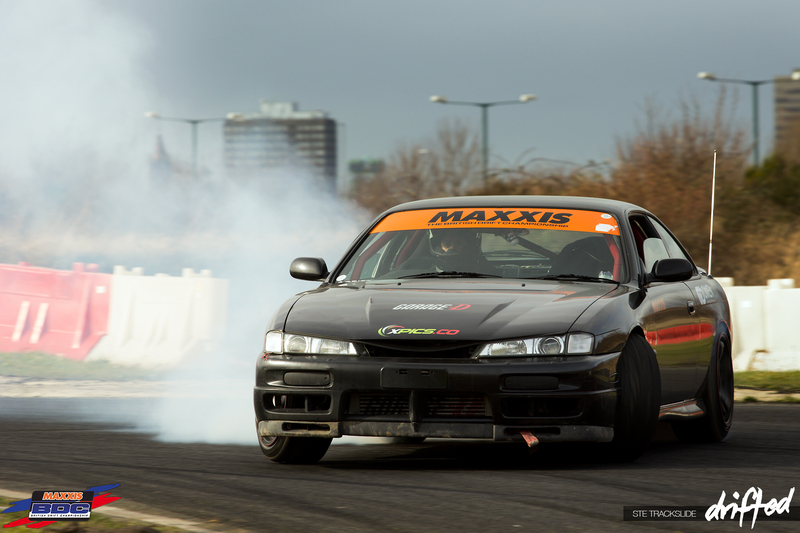 Lewis Mitchell qualified for his Semi-Pro license in his cool looking S14. 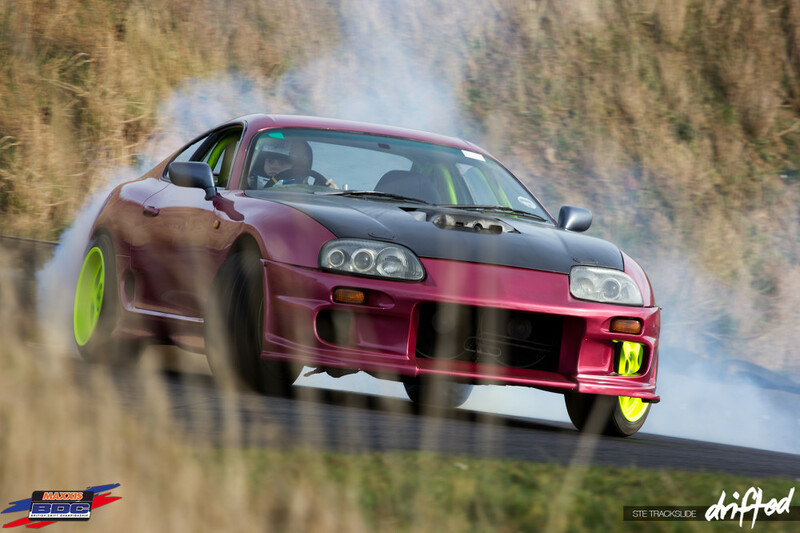 Toni Hardy was out repping the Walker Brothers team colours in her BMW V8 powered Supra. Toni didn’t manage to get her license but the car is a relatively new build; I’m fairly sure she has it in her to get there. 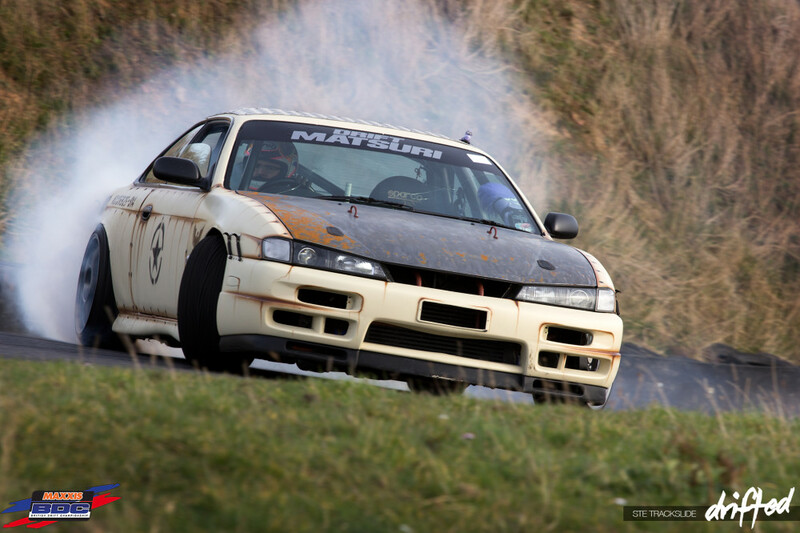 I featured Louis Lawrence’s military style S14a last week and I’m happy to report he qualified for his Semi-Pro license; that rusty rat look bonnet still seems to be a work in progress though. 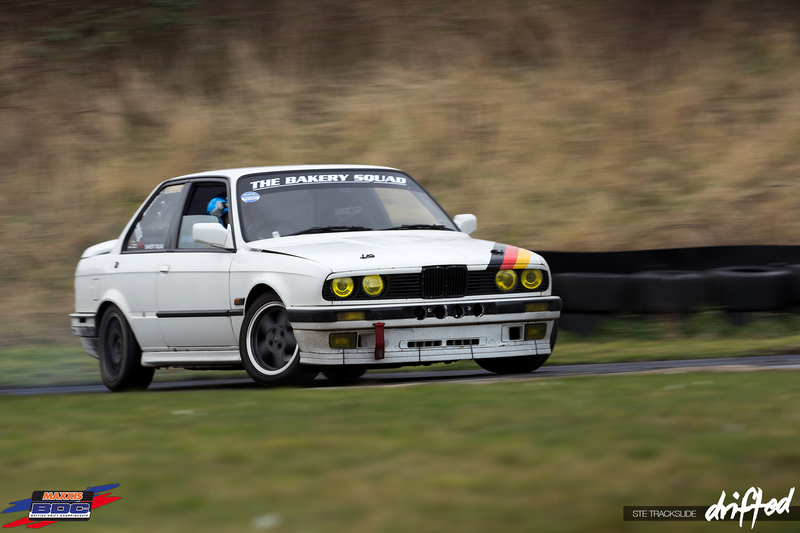 Every time Fraser Stark came tearing around the track in his e30 touring I thought of ‘The Terminator’; I don’t know why and can’t explain it, but he was a man on a mission. Rocking a set of aviators and pushing hard all day he qualified for Semi-Pro. As we moved into the afternoon, the wind finally died off; even the sun popped out now and again. 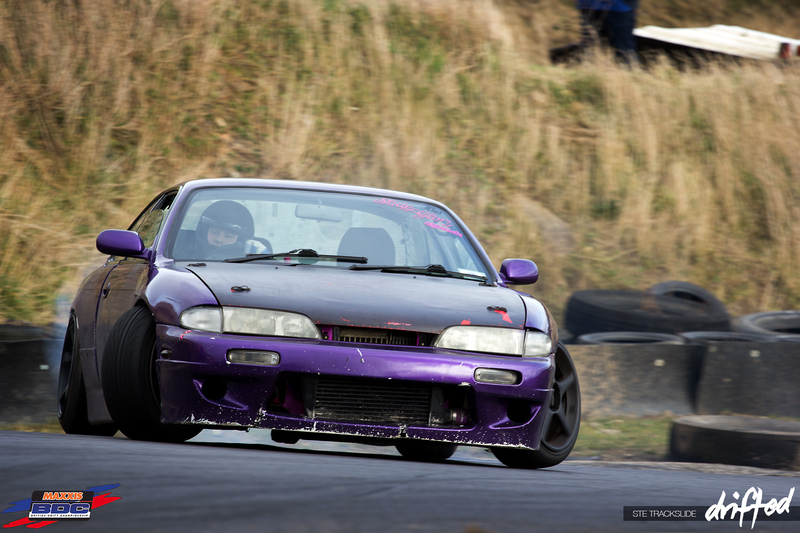 Gavin Worker qualified for his Semi-Pro license in his rather stock looking S14; he drove well all day. 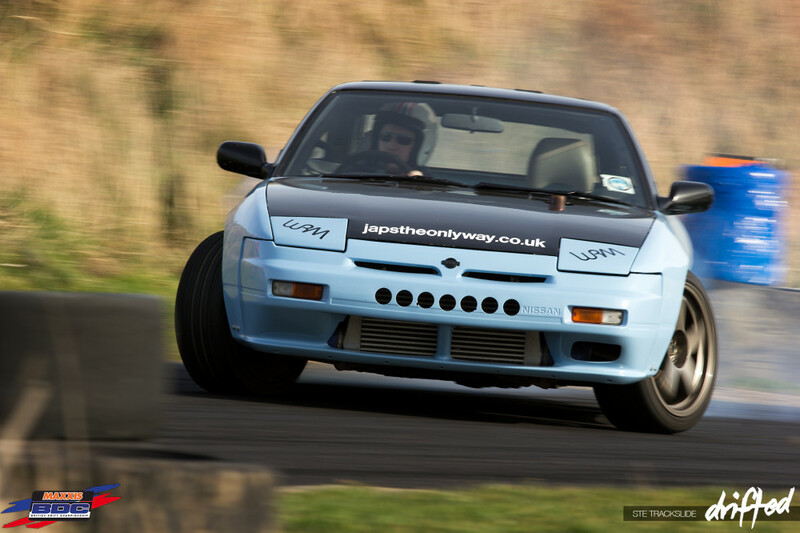 Callum Craddy was out in his little Miata during practice, but Sweeps told him to ‘go find a turbo’. 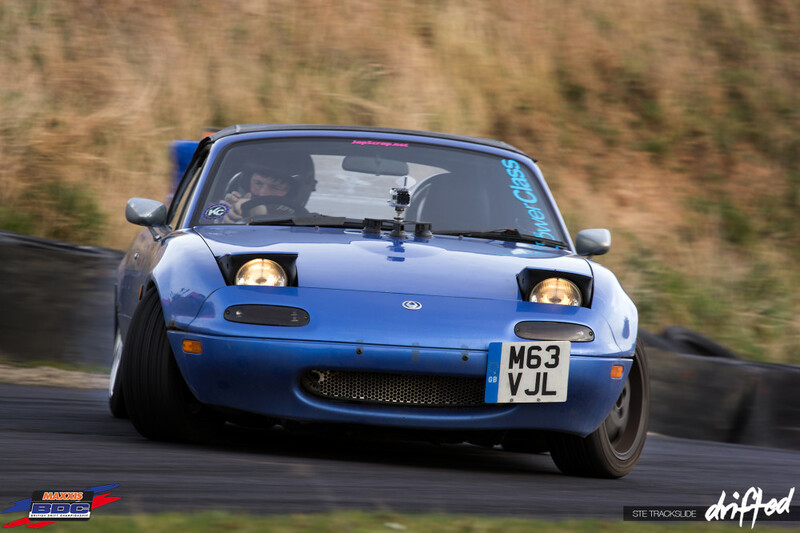 It seems the little MX5 wasn’t up to the job. 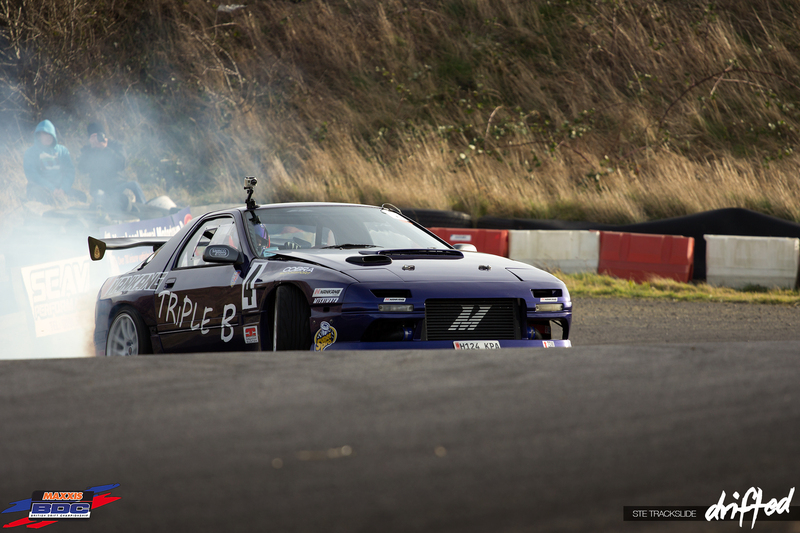 He later qualified in one of the Learn2Drift S14s for his Semi-Pro license. 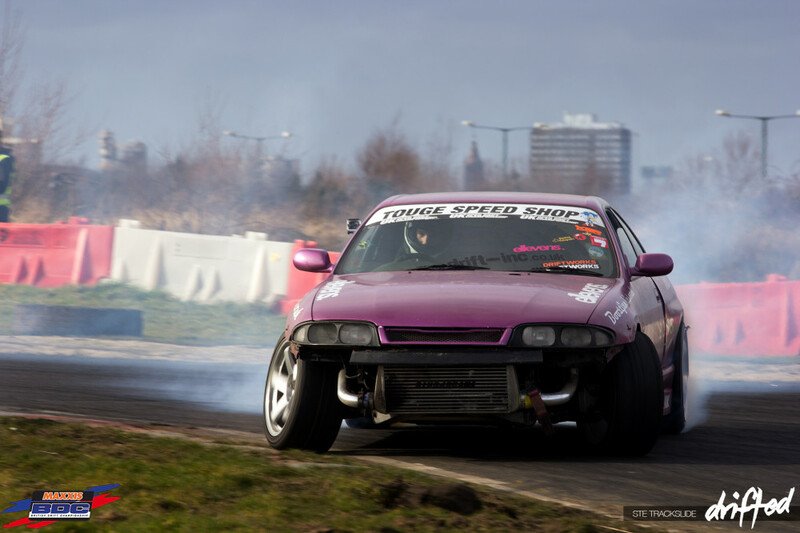 Another lady trying out was Maxxis Girl Michelle Westby in her S14a. Unfortunately she didn’t qualify but we have been told she had been under the weather. This thing sounded immense. 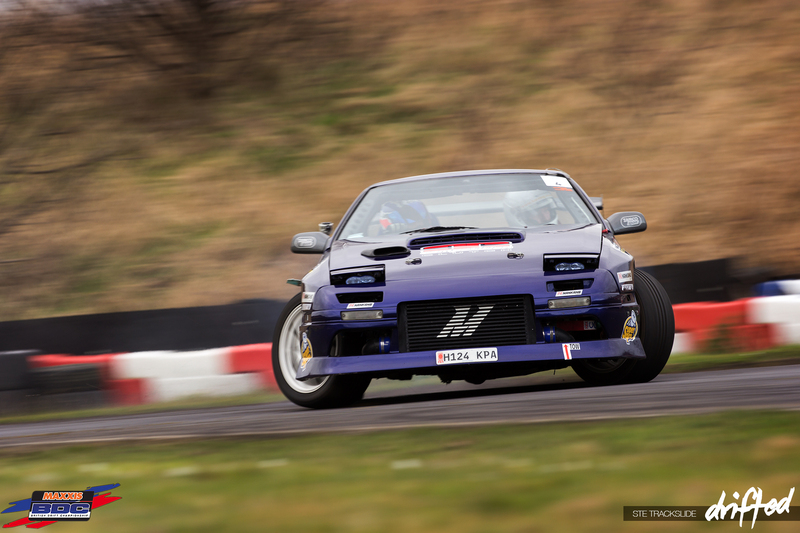 An FC RX7 with a triple rotor; I’m not sure whether he was trying for a BDC license or just out having fun; either way I’m just glad he was there. 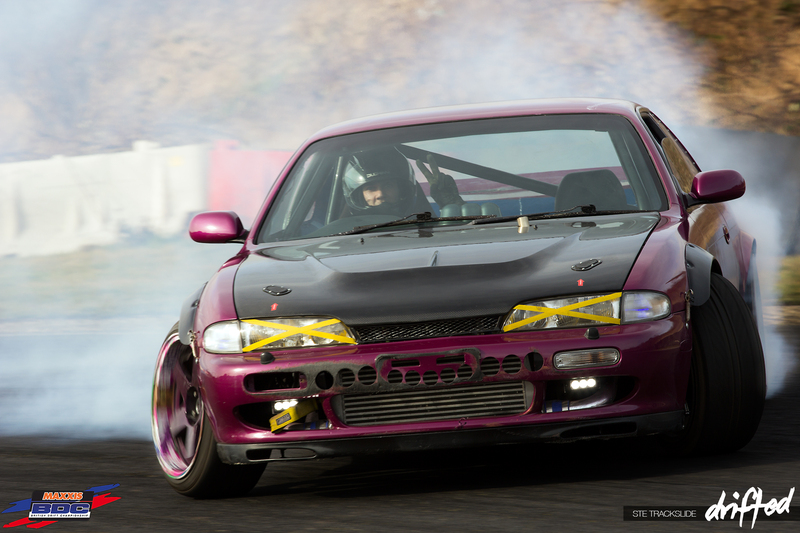 I love a low drift car; Luke Garner’s S14 isn’t the cleanest car in the world, but it looked so good with that wheel fitment. He now has his Semi-Pro license. I guess a drift event wouldn’t be a drift event without an e36 beater, but James Crowe showed up in one that looked like it was straight out of ‘Grand Theft Auto’. As bust as his car looked, he must have been doing something right as he qualified for his Semi-Pro license. 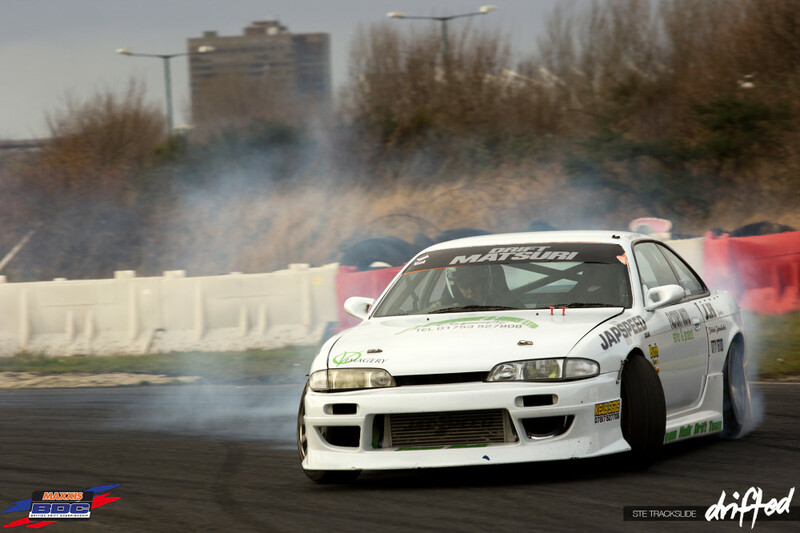 Keilan Woods’ S13 had me puzzled for a while; I didn’t have a clue who he was, although I’d seen the car a couple of times before with what looked like BDC driver Mark Lappages’ rear wheels fitted. 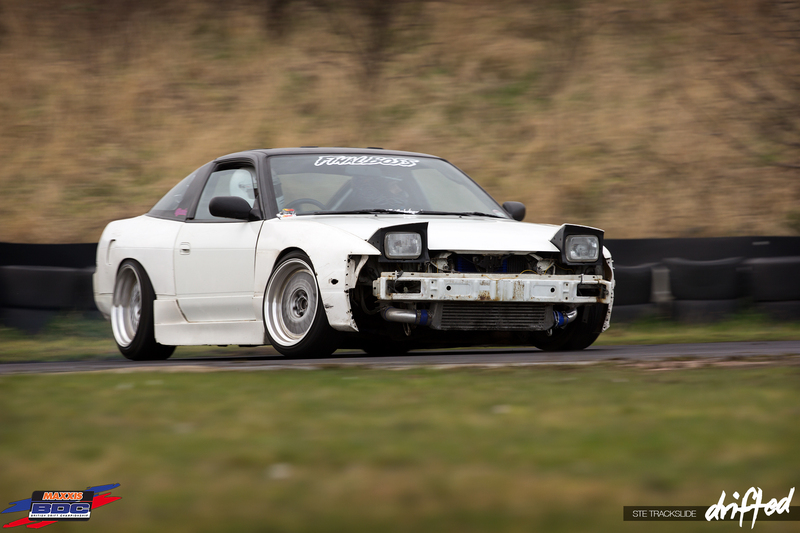 With a good lock kit and from what I could see, a well built car, I was surprised I’d not heard of the guy before. He drove very well and very consistent and earned his Pro license. Lewis Baker pushed very hard all day in his Wisefab’d S14; it goes without saying the car has mega lock, as well as being extremely quick (sometimes too quick with the earlier mentioned wind). He was hitting the corners with serious speed and mega angle. A Semi-Pro license was awarded to Lewis; I think he may well become a serious competitor in the Semi-Pro class this season. The Skid Risk cars certainly stand out from the crowd. With their bright green ‘Hulk’ livery they scream for attention. 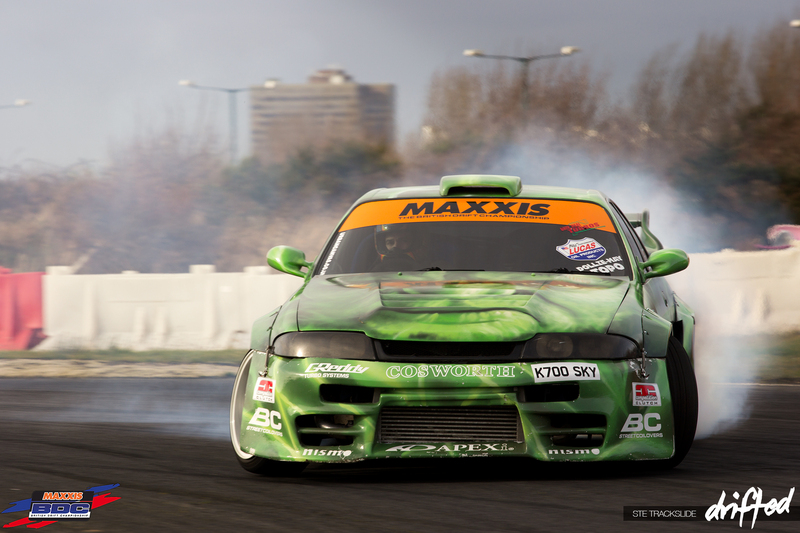 Tom Field earned his Semi-Pro license in one of the ‘Hulk’ mobile R33 Skylines. 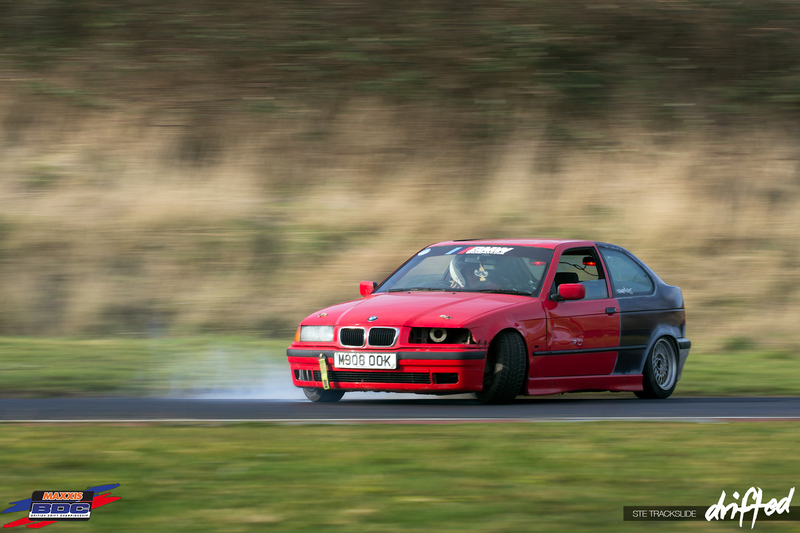 Mark Glegg in his e30 qualified for Semi-Pro. Alfie Mariner qualified for Semi-Pro. And finally Ollie Elmore also qualified for his Semi-Pro license. After qualifying runs the drivers were cut loose on the track for some end of the day skids. 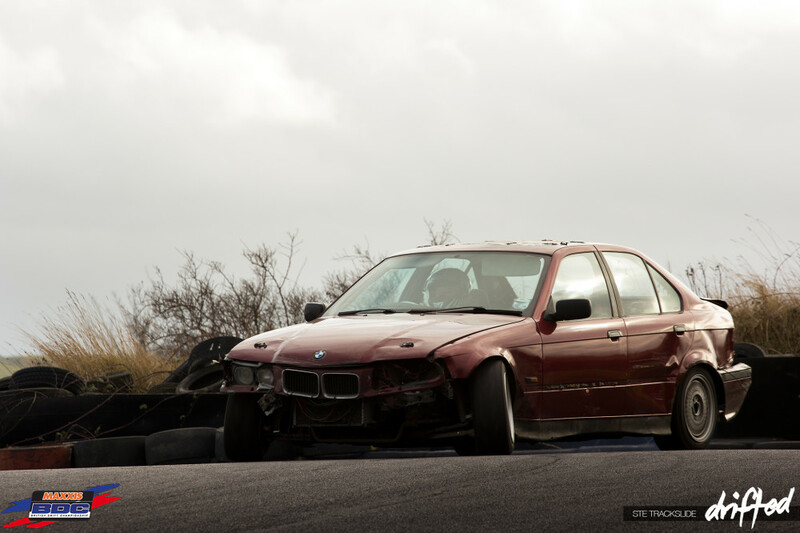 Even Marc Huxley got stuck in with a e36 touring that was there. All and all it was a good day, the wind was brutal but everyone got on with it.